From Goodreads: "Juliette hasn't touched anyone in exactly 264 days. Juliette has to make a choice: Be a weapon. Or be a warrior." Sounds so good that I can barely contain myself!! Lucky for my local bookstore they had this one on order, otherwise I would have been having words with them! Oh awesome pick! 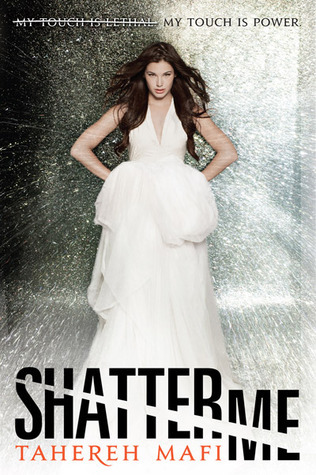 Shatter Me is a fantastic book! I agree, this book sounds so awesome. I'm so excited that its getting such positive reviews too. It makes me want it even more! I am so excited for this book.. I need it NOW..
Wow, I definitely can't wait to read this book either! It sounds so amazing! This book is on my to-read list for so long! Love your choice! I agree I can't wait til it comes out, a few days now. Shatter Me is so good. One of the best books of the year in my opinion. Great choice. Come check out my WOW pick. I'm really excited about this one too! It sounds so awesome! Great pick! I've seen this cover quite a few times this week. I like the cover. It seems like the book is an intense read. Great pick! Thank you for sharing! OOh Shatter Me! Great pick! That's one of my other choices... i've heard a LOT of praises bout this book, and I so so so want a copy of it! It's 100 Follower Giveaway Time! !